A lot of people experience upper back pain. In most cases, this is because of the gelatinous material in the intervertebral discs leaking outside of the disc, which causes a herniated disk. This can lead to several symptoms which can differ depending on the location where the disc herniates since it can apply pressure on a nerve root or the spinal cord itself. However, symptoms common in every case include back pain and numbness. What is Thoracic Disc Surgery? There are plenty of cases of a herniated thoracic disc which will not require surgery. A few days of rest with no or minimal physical activity complemented by painkillers can treat the back pain. However, in instances where the pain prohibits the patient from functioning properly for an extended period of time then surgery is the only option. Such extreme cases can also cause myelopathy, which is a spinal cord dysfunction that can cause severe pain. 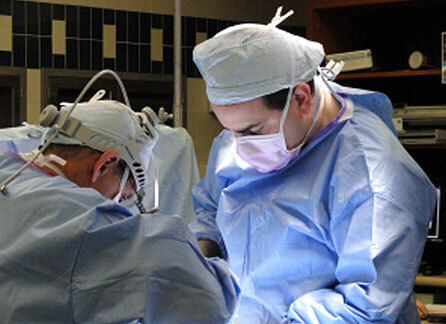 In cases where surgery is resorted to there are plenty of options to go with. Whatever the method used, the goal is to create a decompression which can take the pressure off the nerves and spinal cord. In the past, the most frequent method to do this was a laminectomy. However, this had poor results so it was quickly replaced when better options became available. Nowadays the most common surgeries used in these cases are known as an open thoracotomy for central herniations and a costrotransversectomy for lateral herniated discs. When the pain gets unbearable or the patient presents himself with symptoms of myelopathy than surgery is the way to go. An open thoracotomy is the best option to treat a central or centro-lateral herniated disc. It is usually performed from an anterior trans-thoracic approach. This means that the surgeon will go through the chest cavity to reach the spine, instead of the back. The goal in this surgery is to create a decompression that will take the pressure off of the nerves or the spinal cord. To do this the surgeon will insert a tube into the patient that will touch the affected area and alleviate it of the pressure. With advances in technology this can now be done in a less invasive manner using a VATS procedure, which stands for video assisted thoracic surgery. The surgeon will make several small incisions and insert several small scopes that will allow him to see the affected area on a video screen. This allows for more precise procedures with reduced risk. This type of procedure is usually covered by your NHS. If you choose to go to a private clinic for an operation you can expect to pay somewhere in the vicinity of £15,000 for the surgery. Trusted clinics that employ back pain specialists and experienced surgeons include Spire Healthcare, the West London Spine Clinic and the Ramsay Health Care Clinics. Thoracic pain can be very serious or it can pass in a few days. If your pain persists then you should consult a doctor as you may need surgery.